So there are a couple of motivations for me working through my backlog of games, colloquially known as my "pile of shame", and both involve guilt. The main reason which applies to the entire thing is that I own way too many games and that there's a very real chance I won't be able to play them all. I try to keep my hopes up though that I'll at least manage to have a good crack at almost all of them, at some stage during my lifetime :). I can't quite remember who gifted me this but I have a good feeling it was my brother as he's also played the digital version of this popular board game and has recommended it to me before. Judging that I got this around December 2013, I'm guessing it was a 2013 Christmas pressie... geeze 2013?! That means it's taken me over two years to finally play this game (sorry bro)! Anyway, outside of computer games, I do enjoy playing board games as well and have quite a collection of them in my home. Unfortunately, ever since spawning children (instead of Overlords) it's a challenge to invite friends over or attend board game nights and successfully play some games. So I happen to have quite a lot of board games that are unopened and unplayed (SHUT UP! I'M NOT STARTING A BOARD GAMES PILE OF SHAME THANK YOU VERY MUCH. Oh, who am I kidding :( ). I actually almost played Ticket to Ride (the actual board game) at my friend Danno's place, but this never eventuated since it was home time for a very cranky toddler. 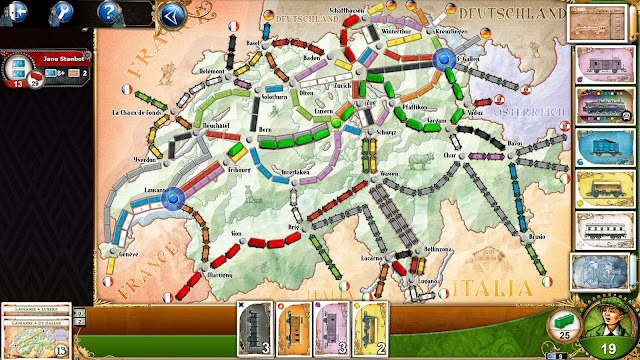 Consequently, my first experience at playing Ticket to Ride is this Steam version of the game and I must say, it's not a bad board game. The goal of the game is to construct railway lines between cities and each time you lay some track you are awarded some points. You receive bonus points from completing missions (i.e. ensuring you complete a track between two specific cities) and having the longest track. You have a limited number of track tokens so when these run out, the game ends and in order to use these tracks you need cards of a particular colour. You see, most of the railway lines are colour coded meaning you'll need a certain number of cards in that colour in order to complete the railway line between two cities. There's obviously an element of chance involved with respect to drawing the cards that you need but there's also some strategy too as you'll need to know when to hold them, know when to fold them, know when to.... *ahem* well, you get the idea. The actual board game Ticket to Ride is a German-style board game designed by Alan R. Moon back in 2004. The game won several awards in the mid-2000s and the game has sold over 3 million copies. So as you can see, it's pretty popular. The game has evolved into a franchise with several variants, expansions and, of course, this computer game. Consequently, if you don't believe in argumentum ad populum being a logical fallacy, then more than 3 million people can't be wrong! The original board game is a family friendly board game and so is this. Perfect if you're a father or mother and concerned about games with mature themes or violence being played in the background. If you have older kids, you can even play the game with them thanks to the aforementioned multiplayer! There are plenty of game modes that change the rules of the game and some of these have been provided free by Days of Wonder (cheers guys). Others (especially expansions set on different continents) require you to pay for the DLC. If you're motivated by achievements then there are a lot of in-game achievements to collect (which also translate into Steam achievements as well). Especially the music that plays for the standard USA map - argh! I do like Scott Joplin's "The Easy Winners" for the main menu theme though (or at least I think it's "The Easy Winners" - it sounds very similar). On my system the game frequently flickers and there are occasional graphical glitches. They're no showstoppers but it's still annoying. Wouldn't you rather play the actual board game? Sure the digital version takes less space, is quick to setup and you can play with people from all across the world - so it's definitely convenient. But like playing at a LAN, playing online isn't quite the same as playing in person :). Ticket to Ride is a faithful rendition of the popular board game that is enjoyed by millions of people around the world. It comes jam-packed with lots of modes and expansions (provided you can dish out the money for them). Besides the occasional graphical glitches and the questionable choice of music at times, there's a lot to recommend if you're on the lookout for a family friendly board game... but on Steam! Is the game worth $9.99 USD? : Yes, the game is bound to provide hours of fun just like the actual board game. If you can get the game on sale (like it is now) it'd be worth grabbing all the DLC too.